The “re-invasion” of Johnson County by the Wyoming Stock Grower’s Association was certainly peaceful yesterday. 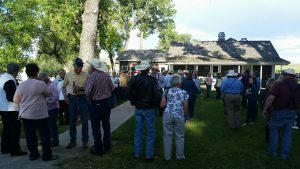 Hundreds of stockgrowers gathered once again at the TA Guest Ranch, 125 years after the infamous Johnson County Cattle War. Some of the attendees lightheartedly donned red bandanas, identifying them as “invaders” as they milled around the yard outside the ranch’s cookhouse. The reception is part of a weeklong conference and trade show that includes a general session at the Bomber Mountain Civic Center today. Governor Matt Mead will be the keynote speaker during an awards luncheon on Friday.